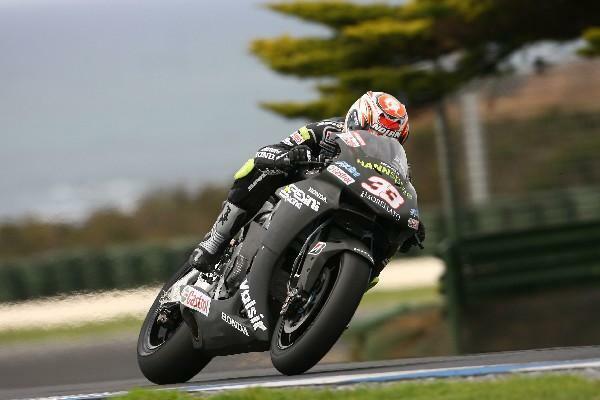 Marco Melandri had a lucky escape on the first day of testing at Phillip Island today after he ran off the track flat-out in sixth gear at the Australian tracks perilous first corner. The Italian ran through the gravel trap and appeared to have saved himself from his first spill on Honda’s new RC212V. But then he noticed he was fast approaching a drainage ditch as he hurtled through the gravel trap and grass run-off. The quick-thinking former world 250 champion decided to put all of his motocross skills to good use by jumping over the ditch. But when he landed he was still doing over 50mph and with nowhere to go, was forced to run back on to the track at turn three facing the wrong way! Melandri said: “It was very scary. When I saw the river in the ground I just hit the throttle and jumped maybe five or six metres. “But 800cc MotoGP bikes are not good for motocrossing. The problem was where I landed, the ground was two metres lower than where I’d jumped, and the bike was badly damaged. “The wheels broke, the footrests broke, the fairing was badly damaged but I didn’t crash. As a result of the incident, Melandri later went out on track once rain ended the day prematurely with just over an hour of track time left on the clock with safety commission members Loris Capirossi and Kenny Roberts Junior. The American later confirmed that the circuit had agreed to move the gravel trap further back in time for the Australian GP in October.